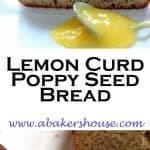 Lemon Poppy Seed Bread with Lemon Curd will brighten your day whether you are in the middle of winter or the sunshine of summer. This year round recipe for quick bread is full of lemon flavor in each bite. Lemon Poppy Seed Bread fits in with the #BreadBakers theme; we are sharing our breads baked with seeds this March. I combined poppy seeds with lemon in this simple recipe. 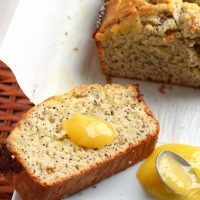 This Lemon Poppy Seed Bread with lemon curd from a Williams Sonoma recipe is elevated by a triple dose of lemon– lemon juice, lemon zest and lemon curd. It is bright and cheerful– even while you are making it the smell of lemon will make you smile and think that winter is nearly over. The lemon curd mixes in the middle layer and, if you look closely, you’ll see that layer in your baked bread. The real lemon kick, though, is the glazing effect that the top layer of lemon curd creates on this bread. There is a lemony, light crust to the top and then you find the poppy seeds dancing below throughout the bread. All of this in a quick bread that comes together with ease? That’s right! So pour yourself another cup of tea, appreciate the sunshine and the melting snow outside and look forward to spring. Preheat oven to 350 degrees F. Grease a 9 by 5 loaf pan with baking spray; line the pan with parchment paper and lightly grease the paper. You'll need two bowls. In one bowl combine the eggs and milk then add the oil, sugar, lemon zest, and vanilla. Whisk to combine. In the second bowl gently stir the flour, baking powder and salt. Add in the poppy seeds. Now pour the wet ingredients into the dry ingredients. Stir with a wooden spoon until ingredients are just barely combined. Don't over-mix. Pour half to three-fourths of the batter into the pan. Drop tablespoons of half of the lemon curd around the batter then top with the remaining batter. You can swirl the batter and curd with a knife or just leave it be-- the curd will settle in the middle layer both ways. Finish off with the remaining lemon curd and spread gently over the surface of the batter. Bake for 50-55 minutes, the edges will brown before the top is finished. Tent with foil towards the end of the baking time if needed. Oh wow! A perfect spring bread. Love all the lemon in it too. Bring on the sunshine! I think spring foods are such a light and happy way to bake. 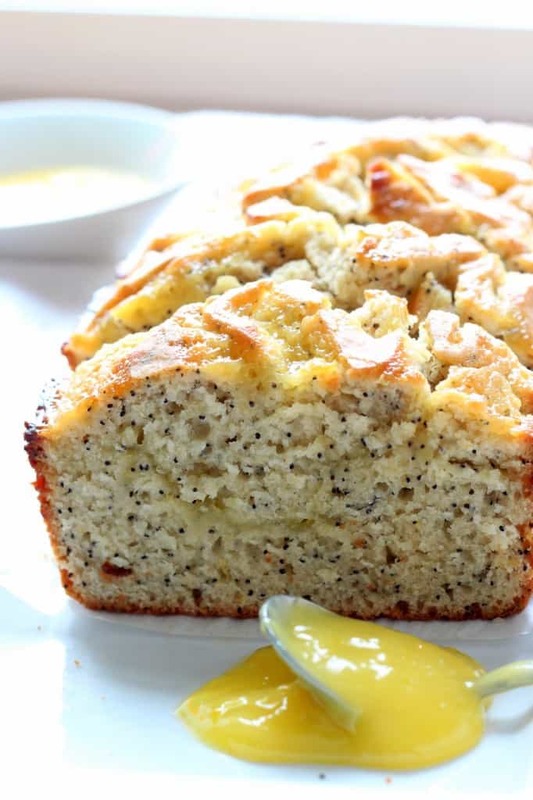 Lemon poppy seed breads/cakes are one of my favorite flavor combinations, thanks for sharing! 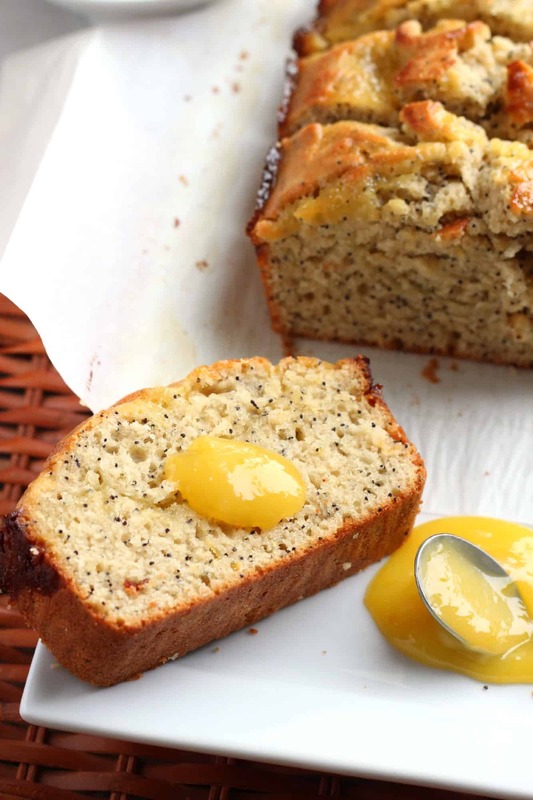 You can’t go wrong with lemon and poppy seeds, that is true! You can not beat the combination of tart lemon and poppy seed. Plus the seeds are good for you. A classic combination for sure! I am such a fan of lemon curd, Holly. I can’t even tell you how big a fan. Lemon curd is sunshine in my mouth and I love that you have put it in and on top this lovely loaf. Even the photos make me smile! I LOVE lemon cake, pie, cookies. Ha!!! You are right! You can’t go wrong with lemon! Lemon poppyseed is one of my favorite flavor combinations. This sounds delicious. I will make these in muffin form next time, I like lemon and poppy seeds too. This is beautifuuuul and so up my alley. I looove lemon in any form, especially lemon curd. 🙂 YUM. Yes, lemon curd is truly a special ingredient. Even spread on toast it is nice but in a bread or dessert it sings! This looks like a fabulous poppy seed bread. I am so in the need of something sweet, that I wish I could swing right by. Good one, Holly. Perfect for Spring! This is the perfect not-too-sweet but definitely sweet-tooth satisfying sort of a bread. I’ll have to make a double batch next time and share. what does a girl have to do around here to get a home made batch of lemon curd from you 😀 I WANT that bread and the lemon curd, Holly. I am more than happy to share! I made this batch with the easy microwave method (click through the link on the recipe) and I’d love to make some for you. Let’s find a time and place to meet! Your bread, and your lemon curd are both delicious looking!! Excellent choice! Yummy sweet bread with the combination of tasty lemon curd.love it………………. I love that there is lemon curd added to this BREAD>>>YUMMY! Your bread looks so amazing Holly! So love breads/cakes with lemon in them! Have never tried lemon curd and I must do it soon! I only wish we got poppy seeds here in the UAE, but maybe I can try this bread when I am on vacation in India! !